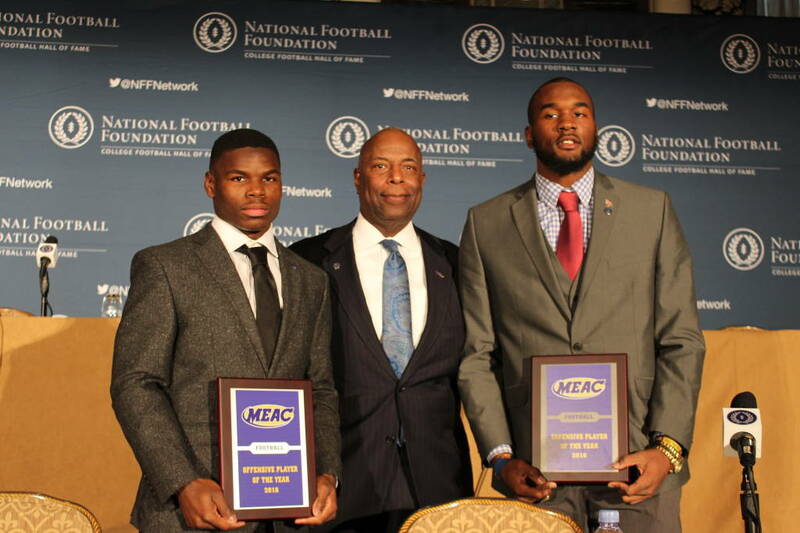 On Tuesday morning, the Mid-Eastern Athletic Conference (MEAC) announced that North Carolina A&T’s Tarik Cohen and South Carolina State’s Darius Leonard were the Offensive Player of the Year and Defensive Player of the Year, respectively. Cohen became the first offensive player to win the offensive award in three consecutive years. The senior is now the MEAC’s all-time leading rusher with 5,619 yards, including 1,588 rushing yards this season. Cohen’s 7.49 average yards per carry, 18 touchdowns and 132.3 rushing yards per game were third in the college football. He broke his own single-season rushing record from 2015 with four 200-yard rushing games, and he led the conference in rushing yards per game, scoring (9.5) and all-purpose yards (160.6) and is a finalist for the 2016 Walter Payton Award. On the defensive side, Leonard had the sixth most tackles in the Football Championship Subdivision (FCS) and led the MEAC with 124. Voters saw his potential in the preseason when he was selected All-MEAC Defensive Player of the Year. His 78 solo tackles were fourth in the FCS and his four forced fumbles were eighth. Overall, Leonard amassed 14.5 tackles for a loss, five pass breakups, 3.5 sacks and two blocked kicks. Against S.C. State’s toughest competition in Clemson, Leonard had his best game, recording a season-high 19 tackles. He is a finalist for the 2016 Buck Buchanan Award. The honors were announced in New York City at the Waldorf Astoria Hotel during the 59th National Football Foundation Awards Dinner.